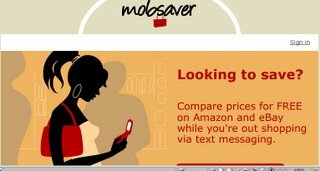 Mobsaver is a SMS website, which free offers you price compairing on Amazon and eBay. While you are shopping in store, if you find something which you are interesting, you can send SMS to save@mobsaver.com, it will send back the price that on Amazon and eBay. After you back home and get online you will find all save list in your Mobsaver account.